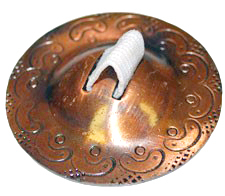 These copper-tone belly dance finger cymbals (zills) made in India are 2 1/4 inch in diameter. Comes in a set of four cymbals, one for each thumb, one for each middle finger. One of the most iconic accessories in Belly Dance is finger cymbals! Playing finger cymbals (or zills) during a performance, whether on stage, at a nightclub, a party, or even in practice, takes the art form to a whole new level and adds another dynamic layer to the music that inspires the dance. 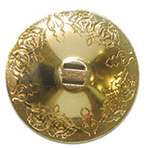 A true Belly Dance classic and a must-have for any Belly Dance accessory kit, these imported copper/bronze-tone zills are 2.25 inches in diameter and make a rich, lovely sound. Comes in a set of four cymbals, one for each thumb, one for each middle finger, and includes elastic strips for each. They are an excellent choice for stage, practice, dance troupes, or to keep in your dance bag. Very pretty, but will need to get them tuned. For the price they are fine.